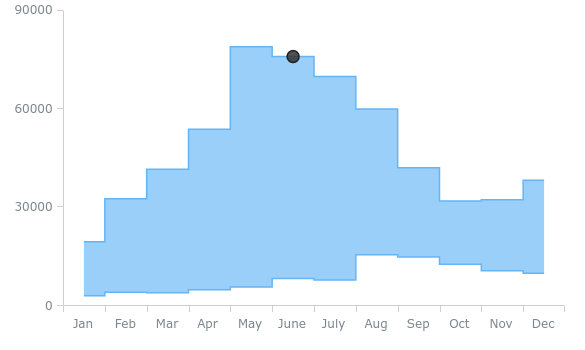 Area charts or graphs are very similar and are roughly based on line charts. They are drawn the same way, the only difference being the area between the line and axis is filled with color or pattern. Area charts give the time-series relationship, that is, the change in a quantity or quantities over time. 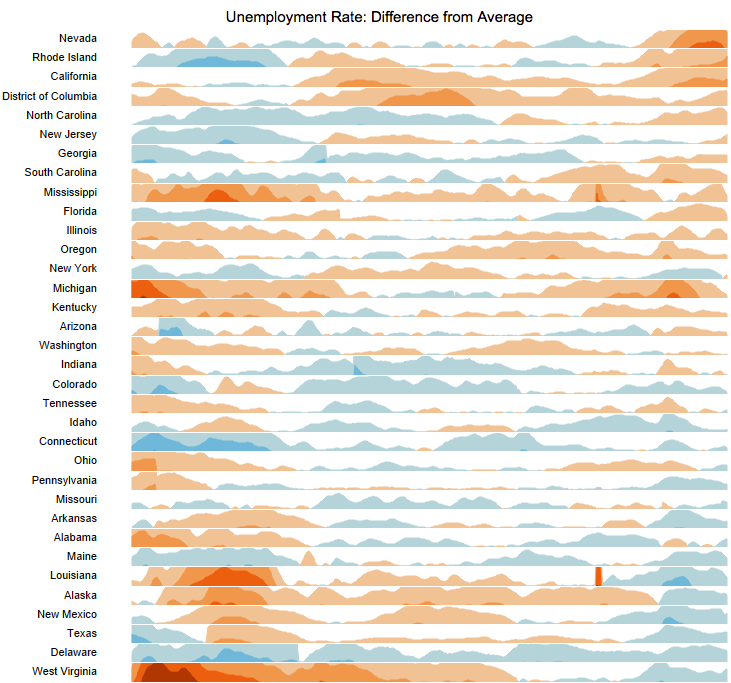 With these charts, one can analyze individual as well as the overall change in data. 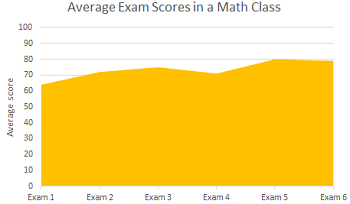 For example, if you need to analyze how well the students of a class are doing in exams in a specific year, you can sum up their marks throughout the course of a year and plot it in an area chart. The resultant chart is illustrated below. Area charts are preferred over line charts when you want to show changes occurring over time but aren’t concerned about showing the exact points or locations of the change happening. This can be seen in the above example graph, the change in marks during exams can be observed without knowing what the exact marks were. The most common types of area charts are stacked area chart and 100% stacked area chart. However, there are many other types of are charts available. 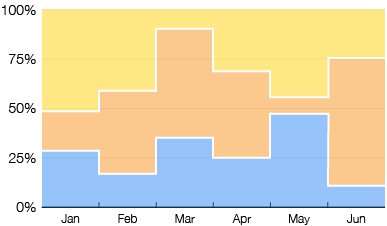 Stacked area charts are very similar to the basic area chart and are drawn the same way. If you are wondering what makes it different from the basic area chart, the answer is the inclusion of multiple data series. They are used to represent parts of the whole relationship. That is, these charts are good at showing how many different quantities of data make up one whole data. It is drawn part by part, but it is the entire chart that represents the total data. Stacked area charts show us what each category represents in the whole data, with a different color used to represent them. The series of data is arranged in such a way that, the next series to be plotted starts at the end of the first one plotted. 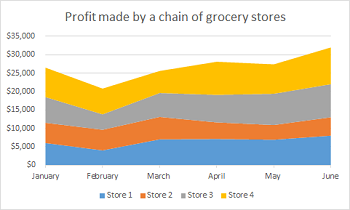 Let’s take an example of profit made by grocery shops each month, this data can be plotted using a stacked area chart. The data in charts take up the whole graph to representation. Data is stacked and plotted in percentage, such that the increasing data is represented 100%. In this chart, real values are not displayed, instead of the percentage of each category is compared. The y-axis, that ranges from 0% to 100% and the data is plotted on it. Here is an example of this chart, where the regional ratio of cosmetic product sales is observed. As you see, this chart is hard to read, as exact points or range of data isn’t denoted and the only percentage of each category can be observed. The 100% stacked area chart is of good use when the contribution of each category is to be displayed and the exact values of changes are not of concern. Stepped Area charts look like a series of steps, like a staircase. 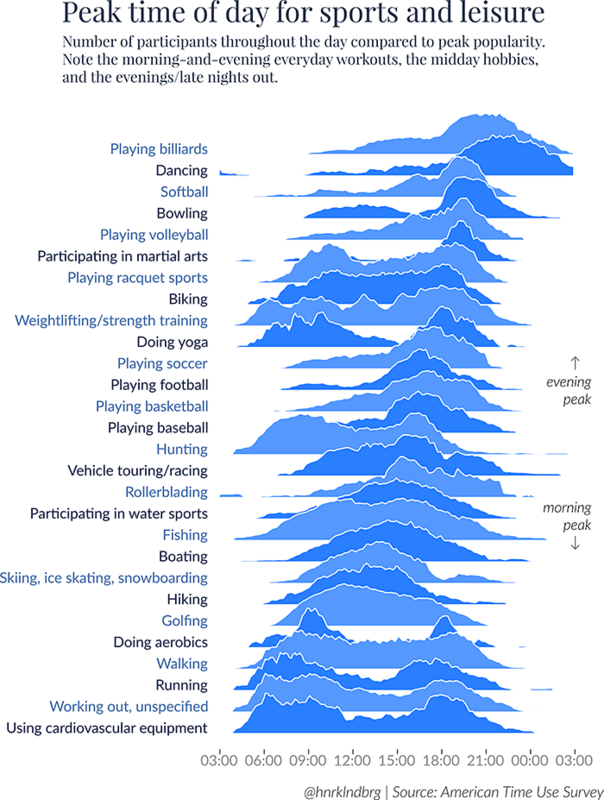 These charts, unlike line or area graphs where points are used, are plotted by a series of steps, which represent the data over time. These charts are used to highlight differences and similarities, drawing a comparison of them instead of just showing the changes over time. For example, take tax rates, a normal area chart might show you the changes happening in the rates, but a step chart will highlight the no change phase, as well as the tell you the magnitude of the change happening. 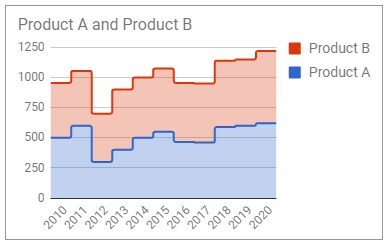 An example of a stepped area chart is given below, showing the sales of two products over 10 years period. This chart as the name indicates is the combined form of stepped area chart and 100% stacked area chart. This chart is drawn like the stepped area chart, placing related data values one above another. It is useful in denoting the shift in percentage change ratios over time. Here’s how a 100% stepped stacked graph looks like. This chart is roughly based on area charts. 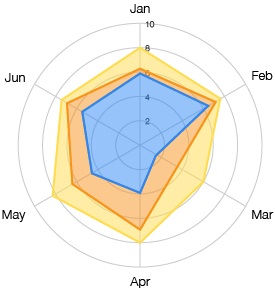 While area charts display sum of numbers or percentage variation, radial charts highlight categories. 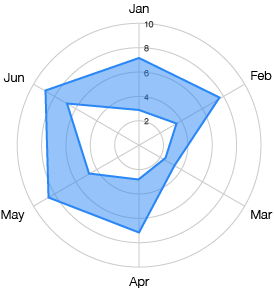 This chart is very much like the radar charts, which is used to display multi-variable data. The difference here is the axis, which is an interval of time instead of being a variable. These charts exhibit a part of the whole relation, i.e., the whole chart is in parts that together form the entire data. The total data takes up the entire chart axis and how much space each category will take, depends upon its alliance with the total data. 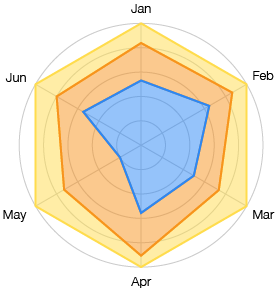 This chart is a combination of Stacked area charts and radial area charts. 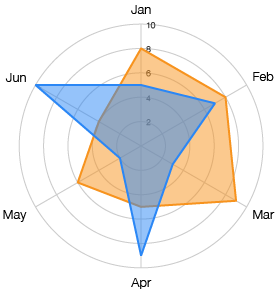 Unlike both though, this chart does not have polygon shapes that overlap each other or show parts to the whole relation in data. In fact, it is more like a stacked area chart, only drawn in a polar grid. Range Area charts are in many senses like area charts. Only here instead of the line and the axis, the area between two lines formed by a high and low range of values is shaded with color or pattern. 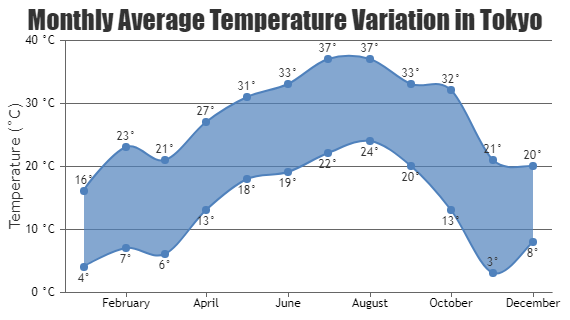 This chart is mainly used to display a range of data, between the minimum and maximum values. For instance, consider this example of climate change in Tokyo over a year. The low and high temperance range can be displayed using Range Area Charts. Range Step Area Charts is almost same as Range Area Charts, the only difference being, instead of high and low data values being joined by lines, here they are joined by horizontal and vertical lines forming a series of steps. The area between these 2 steps is shaded with color or pattern, to denote the range. This is just another version of Range Area Graph with a combination of Range Area Charts. Here, two high and low values range lines are drawn and the area between them is shaded, within a polar grid. The rest of the mechanism remains the same. An illustration of the same is given below. Joy plots are a series of successive combination of many density or area graphs arranged in a column. This arrangement of data is used when you are dealing with many data and want to compare the distribution of many subgroups available within that data. Horizon charts are used to compare area graphs. In the illustration below, we can see many bands with only a section of area charts being visible. The red color denotes the negative values, while the blue denoted the positive ones. This chart is an art form to display a humongous amount of data, as it saves space and is easy to read. Below is an example of a horizon chart showing the price change in food items since 1990. These are the familiar types of area charts available. that may be suitable for plotting your data.